Fennimore senior Maguire Fitzgerald struck out five in a five-inning no-hitter against Southwestern last Friday. 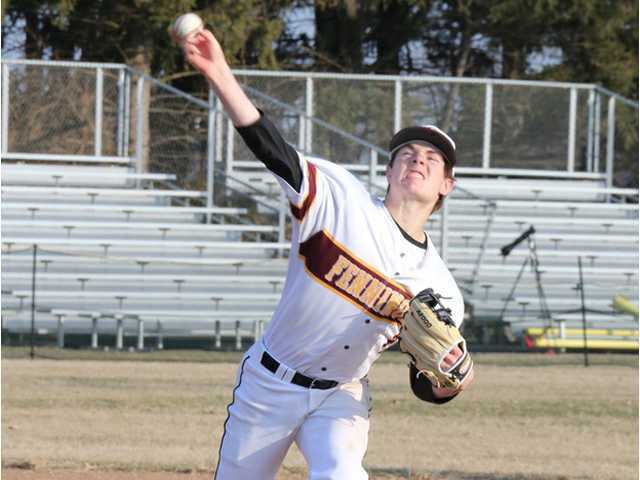 POSTED April 11, 2019 11:43 a.m.
FENNIMORE — Fennimore senior Maguire Fitzgerld threw a five-inning no-hitter and the Golden Eagles pounded out 10 hits in a 10–0 five-inning victory over visiting Southwestern Friday evening. Fitzgerald was scheduled to come out of the game in the sixth inning after throwing 63 pitches though five innings with Fennimore holding a commanding lead, but junior Will Ahnen’s two-out, two-run double ended the game via the 10-run rule and gave Fitzgerald his first career no-hitter. Fitzgerald (2–0) struck out five and walked two and allowed only two base runners in the game. Ahnen finished 3-for-4 with two doubles, a solo homer in the first inning, three RBI and three runs scored. Senior shortstop Trevor Wanek went 2-for-3 with two RBI and two runs scored. Junior Derek Turben went 2-for-3 and sophomore Warren Adam drove in a pair of runs. Ahnen (1–0) picked up the five-inning complete game victory in Fennimore’s 17–2 win at Iowa–Grant last Tuesday. He struck out 10, walked three and allowed just one earned run on three hits. Senior Derek Kephart went 3-for-3 with a double and three RBI in the win. Wanek (2-for-3), Maguire Fitzgerald (2-for-3), Teagan Napp (2-for-3) and MacCoy Fitzgerald (2-for-3) each had multiple hits in the win. Fennimore (3–3, 3–0 SWAL) fell to 0–3 in non-conference games with a 16–6 loss at Lancaster Monday afternoon. Junior Dawson Bowen went 4-for-5 with two triples, a home run, seven RBI and four runs scored to lead the Flying Arrows (3–1). Sophomore Hayden Knapp went 3-for-4 with three RBI and four runs scored. “Lancaster is a potential regional opponent and a neighboring rival,” said Sheckler. “Even though they aren’t in conference that is a game we want to win. We held Maguire and Will back from pitching to save them for Tuesday night’s conference game at Mineral Point, but give Lancaster credit, they are a good hitting team and they took it to us. Kephart went 2-for-4 with a double and a RBI to lead Fennimore in defeat. Noah James also had two hits in the loss. NEXT: Fennimore traveled to Mineral Point Tuesday afternoon and will now travel to River Valley on Monday before hosting Cuba City on Tuesday. Leading hitters — F: Trevor Wanek 2x3, Macoy Fitzgerald 2x3, Maguire Fitzgerald 2x2, Derek Kephart 3x3, Teagan Napp 2x3. 2B — F: Magurie Fitzgerald, Kephart, Napp 2. W — Will Ahnen (1–0, 5IP, 3H, 2R, 1ER, 10K, 3BB). L — Carter Christianson (0–2, 1IP, 4H, 5R, 5ER, 1K, 3BB). Leading hitters — F: Trevor Wanek 2x2, Will Ahnen 3x4, Derek Turben 2x3. 2B — F: Ahnen 2, Derek Kephart, Wanke 2. W — Maguire Fitzgerald (2–0, 5IP, 0H, 0R, 5K, 2BB). L — Pearson Kephart (2IP, 5H, 5R, 5ER, 4K, 2BB). Leading hitters — F: Derek Kephart 2x4, Noah James 2x3; L: Hayden Knapp 3x3, Dawson Bowen 4x5, Caden Straka 3x4, Ryan Gallinger 2x3. 2B — F: James, Kephart; L: Straka. 3B — L: Bowen 2. HR — L: Bowen. W — Cole Kreul (6 IP, 9H, 6R, 3ER, 4K, 0BB). L — Boston Flannery (0–1, 3.1IP, 6H, 5R, 5ER, 2K, 1BB).